The pictures of the Island are nothing short of haunting. The buildings are in varying stages of decay. Their abandonment reflects the tragedy that clothes the island from first contact with civilization. 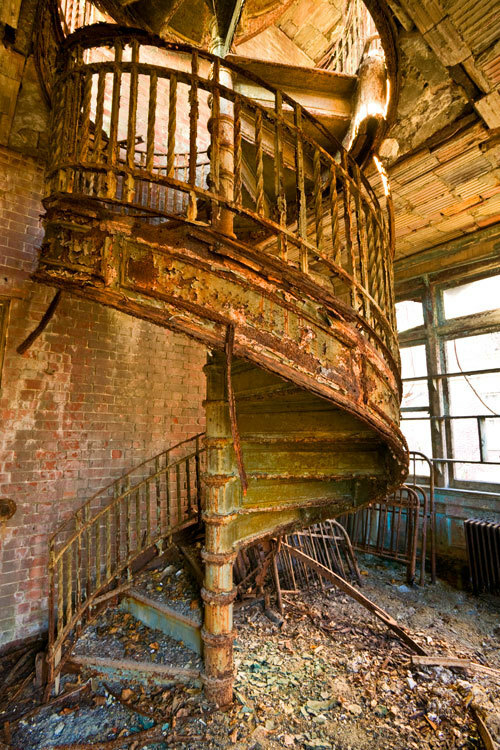 North Brother Island is part of New York State. In 1886 it was used as a quarantine hospital for patients with communicable diseases like small pox. Eighteen years later wreckage from the General Slocum, would wash up it its shore. A passenger steamboat taking Lutheran churchgoers to a picnic, the event tragically ended in fire on the water- and the death of 1, 021 of her passengers. It was considered one of the worst disasters in the United States before September 11, 2001. A cottage on this 13 acre island was the home for one woman for 23 years. Her given name was Mary Mallon, but she is better known as Typhoid Mary. A cook by profession, she was the first known healthy carrier of typhoid- a severely infectious bacterial disease that causes a high fever, headache, intestinal hemorrhaging and sometimes death. As the first healthy carrier of this disease, the authorities didn’t know how manage Mary Mallon. She was discovered by George Soper, a civil engineer who specialized in typhoid. The trail of disease ridden bodies led to her kitchen. A strong willed woman, she fought him off with a knife. He would turn to a like-minded strong willed woman- Dr. S Josephine Baker who would capture Mary. Mallon was held at North Brother Island for three years, believing she was a victim of an unjust law. Eventually the American people and a new health commissioner decided that Mallon should be freed as long as she pursued a new profession. She had seemingly succeeded until a maternity hospital was attacked by typhoid. The cook- a Mrs. Brown was discovered to be none other than Mary Mallon. Many thought her alias implied cruel intent, others realized that her name was well known and the profession of cook was the highest paying job for a poor Irish working woman. Unfortunately her choice of profession and location killed two hospital patients. Mallon was banished once again to North Brother Island for the next twenty-three years- until her death. After the passing of the most notable patient, the hospital was closed. The island was used for returning soldiers of World War Two going to school, and then again abandoned. The last attempt to breathe life into the island was as an addiction rehabilitation centre for teens in the 1950s. In the shadow of corruption and recidivism the centre was shut down and the island was left to the elements and ghosts of the past. What stories the moss covered walls could tell…. This entry was posted in 1900-1914, 1920s, historical and tagged Dr. S Josephine Baker, General Slocum, George Soper, Mary Mallon, New York, North Brother Island, quarantine, Typhoid Mary. Bookmark the permalink. This is awesome! It gave me the creeps (in a good way). Thank you so much for stopping by Jeannie. I am honoured to have someone from NYC visit the Website!